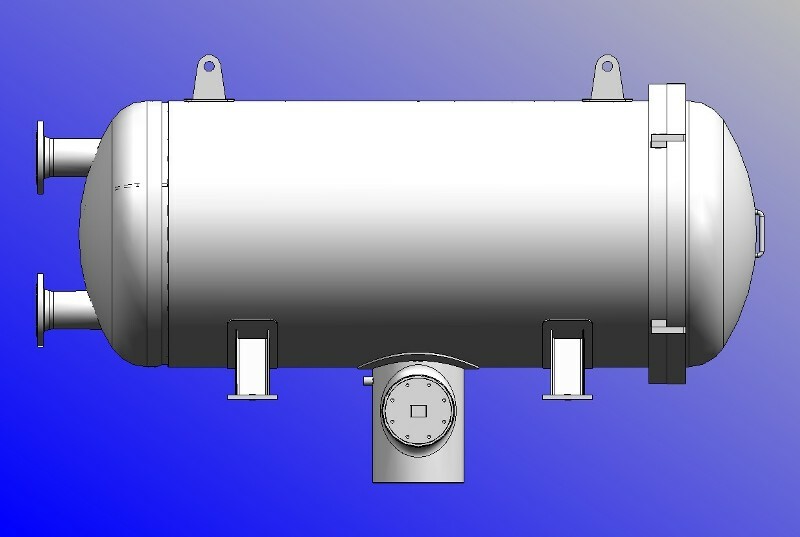 The Hydro-Carbon series vertical VFWS and horizontal HFWS two stage liquid filter water separators are specially designed for the removal of free and emulsified water from (aviation) gasoline, jet fuel, diesel fuel, gas oil and other light hydrocarbon products. A two stage filter separator should be used where the highest degree of water removal is required. It also serves as a filter for rust particles and muck from the products, thus delivering a clean, dry fuel into the discharge line. It does so by coalescing the fine droplets of water found in the emulsified state and separating these from the product stream. The process of coalescing is accomplished by flowing the continuous phase of the product through a coalescer media, which has an infinite number of irregular passages of very small diameters. By impingement the emulsion is broken into minute particles of water and as these particles progress through the entire depth of the media, they are coalesced into droplet size. Due to the extremely small diameter of the irregular continuous passages of the coalescing media, an accessory function of this media becomes one of filtering solid particles. As the product stream flows to the separator outlet, the droplets of water which leave the coalescing media are removed by two methods. One is by utilising the common force of gravity and the coalesced droplets are deposited into the water sump. Furthermore the product stream flows through a separator stage. The separator is provided with a hydrophobic membrane to repel the very fine droplets of water. This second stage media used for repelling droplets of water, also functions as a very efficient back-up or secondary filter element, thereby giving double protection against the transfer of solid contaminant through the separator/filter unit. Hand operated vent valve / Automatic air eliminator / Liquid level gauge / Automatic water drain / Differential pressure transmitter / Pressure indicator / Safety valve for thermal expansion. Coalescer cartridges are mechanical devices to filter solids and separate two immiscible liquids. The most common uses are the filtration and separation of water from aviation fuel, light fuel oil, diesel, gasoline and various types of oil. The free water droplets and solid contaminants in hydrocarbons are, in the vast majority of cases, no more than a haze of microscopic particles suspended in the fuel and invisible to the naked eye. The measurement of these particles is usually quoted in microns or, more correctly, micrometers. As an indication of these measurements in comparative terms the thickness of a human hair is approximately 50 microns whilst the smallest particle visible to the naked eye is about 40 microns. The majority of water and solid matter particles in a contaminated hydrocarbons are less than 30 microns. 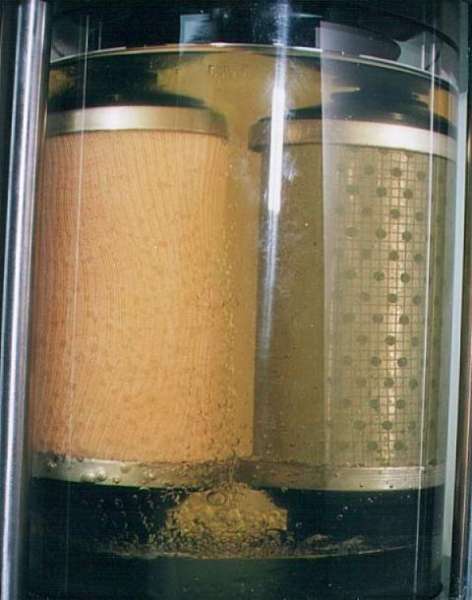 It is the function of the coalescer cartridge of the filter/separator unit firstly to remove the solids and then to merge the particles of water into larger droplets of five to ten millimeters in diameter before they are ejected to fall, under gravity, to the sump from where the water accumulation can be drained. The construction and design of a typical filter/coalescer cartridge is shown above. The fuel/water/solids mixture first flows through a pleated assembly of fine-grade filter media, the pleated configuration is necessary to obtain the optimum area consistent with maximum dirt-holding capacity and efficiency. 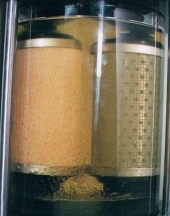 Following the almost total removal of solid contaminant by this first filtration stage the fuel/water emulsion then passes through the coalescing media, graduating from a very fine grade material to a coarse grade material to effect the gradual coalescence of water particles from their original microscopic size to visible droplet size. The initial mechanisms of both filtration and coalescence in fibrous materials such as filter paper and fibreglass wraps are virtually identical in that they rely on the probability of collisions of particles with the fibres within the media. In both cases the media consists of numerous layers of fibres roughly perpendicular to the flow which forms a maze and the liquid passing through this maze is forced to follow tortuous paths around the fibres. If the flow through a section of the media is visualised as hundreds of tiny streams or jets, which are forced into many changes of direction and cross-sectional shape as they twist and turn through the maze of fibres, it will be easier to appreciate that the probability of solid or water particles colliding with a fibre is an extremely high one. After collision has occurred the mechanisms of filtration and coalescence are quite different. In filtration the solid particle becomes permanently attached to the fibre and colliding particles gradually build up until a comparatively large opening surrounded by fibres is eventually blocked. When the media of the primary filtration stage becomes partially blocked in this manner the resistance to flow will increase rapidly, and it will become necessary to replace the cartridge. The mechanism of coalescence is different from that of filtration, because the particles of water do not permanently attach themselves to fibres. Provided that the fibres are of the correct size, density and material, a water particle that has become attached to a fibre will gradually slide along the fibres in same direction as the flow until, as shown below, it meets an obstruction such as an intersection of fibres. The water particle will momentarily be held at this point until other particles following the same or adjoining fibres merge in turn to form an increasingly larger droplet. As the droplet increases in size the flow around it will be imposing higher and higher forces at its surface (viscous drag) until, at some critical point, the droplet is torn away to follow another fibre and collide with another intersection and the process is repeated. By the time it arrives at the final layer of the fibrous wrap the droplet will have been enlarged by the merging of possibly hundreds of original tiny particles, and when it is finally torn from the fibrous medium it is confronted by yet another obstruction – the cotton sock wrapped around the outside of the cartridge. The majority of water droplets will, by this time, be too large to pass directly through the small holes in the sock, and they will be held against its inside surface until further droplets collide and merge to cause further enlargement. Eventually, the large droplet will be forced through the sock in the form of an elongated tube of water, which regains its spherical shape immediately after ejection from the sock and sinks, to the bottom of the filter/separator unit. The coalescer technique as described above can also be used for the separation of liquids from gasses. Although the basic operation is the same some differences do occur. Gas coalescers are usually provided with a baffle system for preseparation. The baffle system removes slugs of solids and liquids before the gas is going through the coalescer. This enlarges the life time of the coalescer cartridges and improves the separation efficiency of the gas coalescer. Since the viscosity of gas is low, most gas coalescers operate without separator cartridges. The droplets formed by the coalescers are settling under gravity without the need for separator cartridges to remove carry-over droplets. Applications for gas coalescers are – among others – air and gas process streams, plant and instrument air, plant gas receiving points, natural gas receiving points and refrigeration systems. Please read more on the page Gas coalescers. The droplets formed by the coalescing action can be removed from the main stream by using purely gravity or by employing separator cartridges. The majority of the droplets formed will settle within a short period of time. Smaller droplets will require a longer retention time to be separated from the main flow. In applications where due to the process conditions the reliability of separator cartridges is questionable the use of gravity separation is preferred. In other applications the benefit of smaller vessels is appreciated resulting in vessels which combine coalescer and separator cartridges. Vessels usually contain more than one of each element type. Each element has a maximum recommended flow rate. This may dependent on the application. The length of these elements can vary up to 1420 mm or 56″. The filter water separator can be orientated either vertically or horizontally. Inconsistencies can be caused by excessive additive content, certain chemical impurities or microbiological growths in the hydrocarbon, and through combinations of these possibilities there is a likelihood that some of the water droplets emitted by the coalescer cartridge will be too small to fall to the sump within the short available distance within the vessel. To prevent the carry-over of these smaller droplets into the filter/separator outlet a bank of stripper cartridges is interposed between coalescer cartridges and the outlet to act as a safety screen. This screen is, in reality, a hydrophobic (water-repellent) barrier, which allows the passage of fuel but prevents the penetration of water. The stripping mechanism is illustrated above and is known as ‘pore catchment’. By combining water resistance and a critical pore or mesh size the media repels any suspended water droplets and, while they are held against the surface of the media by the flow trying to force them through the holes, further droplets following behind will collide and merge with the initial droplets until they are enlarged to such a size that they will fall, under gravity, to the sump area below. The stripper cartridges are, like the coalescer cartridges, cylindrical in shape but the media is a cylindrical wrap (horizontal and vertical units) or pleated element (vertical units only) of special material. The optional materials available are a high strength siliconised paper, Teflon-coated fine mesh, or a unique woven synthetic material. Stripper cartridges in the latter material simply require thorough cleaning at each service period.